To finish up our Peace wall hanging. We will put all the trees in a circle and add the letters. Lay out your red background fabric. You should have the circle marked for reference to place your trees. Place the trees around the edge of the circle, let the trees stick out beyond the marked circle just a little. Cut out all the Peace letters using a pair of sharp KAI scissors. Place all the Peace letters in a circle under the trees. Place the big P slightly off center and tucked up under every fourth tree, and then place the small letters in-between. Place a clean white cloth over the whole unit and steam set all the fused pieces in place. Layer your red background square with batting and backing fabric, I like Fairfield 60/40 for my batting. Use 505 spray basting adhesive to hold the layers together for machine quilting. This is a wall hanging and the backing fabric will only be seen when you take it down and store it. So use some old fabric you bought and you can’t for the life of you remember WHY you bought it. Now machine quilt this to your liking. 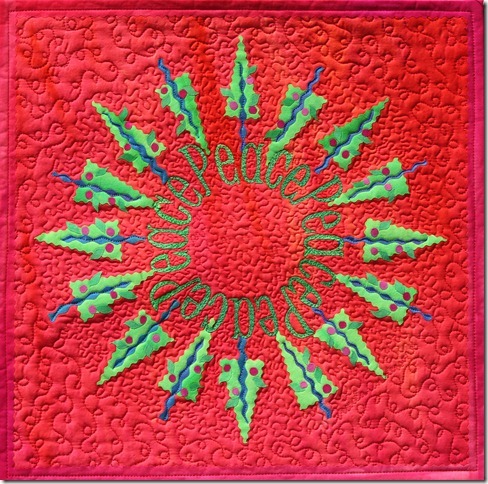 First thing I did when I quilted this was to do a zigzag through all of the Peace letters. I then did a quick squiggle up the middle of each tree trunk. Next I did a tighter stippling in the central part of the wreath. And lastly I free motion quilted a bigger curly queue design in the outside area of the wreath. Once it is all quilted, square the quilt up. Mine measures 16” square but yours could be different. Add a sleeve and fused binding. You can refer to my tutorials at the top of the page for these. You can have this hanging on your wall for Christmas Day or until Valentine’s day. In order to qualify to be in the drawing for the free give away you MUST –1) Leave one comment, one only, telling me which New Year’s Resolution you kept this year? If you didn’t keep one, which one do you’d wish you kept? I will draw the winning name on Monday. Have a safe weekend. Watch out for late shoppers. WELl! Wanted to learned a new free motion technique each month. Made it through March. Maybe I’ll try again this year. Created 4 pieces I’m very proud of instead! Wish I had kept the one to eat better. But also to sew or paint every single day for at least a few minutes. Thanks so much Frieda for showing such detailed steps, I am working right now on a mug rug using a couple of the trees. One resolution I did keep was to try a new technique. I stumbled over paper piecing and finally figured out how to do it!